We know there’s no “I” in team … or, as my son once said during a T-ball game, “There’s no ‘I’ in ‘victory.” Still trying to figure that one out. 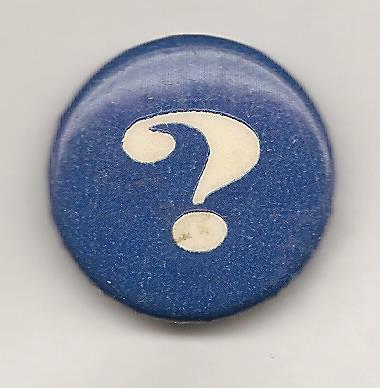 But as it turns out, there are not many unknown campaign buttons that begin with the letter “I” either. We’ve been offering photos of these unknown buttons (arranged alphabetically by candidate names) for you to help identify. You’ve been doing an amazing job, for which we are very thankful. (Previous “Who Dats”: Unknowns beginning with the Letter A, Letter B, two pages for Letter C (here and here), Letter D, Letter E, Letter F, Letter G and Letter H.
And now we’re back with another selection of campaign items of candidates, this time focusing on the letter “I.” As in, I DON’T KNOW WHO THESE GUYS ARE!! There aren’t many of them, but we here at the Political Junkie decided that “I” deserves its own page. It’s only right. 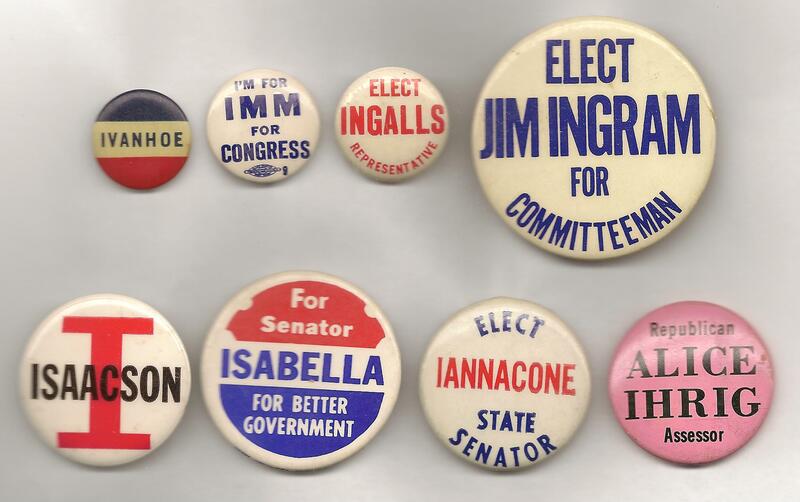 NOTES: In the top row, “Imm for Congress” could be Val Imm, a Republican who sought a House seat in Minnesota in 1948. In the bottom row, “Isabella” may be from upstate New York (’70s? ’80s?). And Alice Ihrig is thought to be from Chicago. Fred Isabella was a Democratic State Senator from the Capital region of NY. He replaced Mary Ann Krupsak when she was elected Lt. Governor in 1974. He only served one or 2 teams before being beaten by a Republican. Alice Ihrig was the Republican nominee for Cook County Assessor in 1974. She lost to Democrat Thomas Tully. Do I dare post a link?